Your first charm starts here! Okay, so you have read up all the background info on what a charm is, how it works, and what parts of the charm do what, now it is time to dust off your favourite code editor (no arguments please) and get charming! Although it is possible to create a charm without using anything other than a text editor, we are also going to make use of the very excellent time saving plugin for Juju, Charm Tools. Install the Charm Tools now. Then hurry back. As we are writing a charm, it makes sense to create it in a local charm repository (see how to deploy from a local repository here) to make it easy to test in your Juju environment. Fire up your text editor and load/edit the README file. This step is especially important if you intend making your charm public, but it is very useful even if your charm will only ever be seen by you. The README is a good place to make notes about how the charm works, what information it expects to communicate and how. Although a plain text file is fine, you can also write your README file using Markdown (in which case use the .md suffix). The advantage of this, other than it looks quite neat, is that the Charm Store will render Markdown properly online, so your README will look and read better. Obviously, you can include any useful info you wish. The metadata.yaml file is really important. This is the file that Juju reads to find out what a charm is, what it does and what it needs to do it. summary: Vanilla is an open-source, pluggable, multi-lingual forum. The summary should be a brief description of the application being deployed, whereas the description can go into more detail. application_development - use this for platform charms like Rails, Django, etc. Next we need to define which relations are actually provided or required by this application. This is done by listing the relation type (provides, requires, or peers), the name of the relation, followed by the interface type, indenting each level. The relation name given here (website) is important as it will be used to name the relation hooks that we write later. Juju uses the interface name to determine the other charms in the model which can be related to this one. Similarly we also need to provide a "requires" section. In this case vanilla needs a connection to a database. Checking out the metadata of the charm for MySQL we can see that it provides this via the interface name "mysql", so we can use this name in our metadata. summary: Vanilla is an open-source, pluggable, themeable, multi-lingual forum. As you will know from your thorough reading of the charm components, the hooks are the important scripts that actually do things. You can write hooks in whatever language you can reasonably expect to execute on your deployed environment (e.g. Ubuntu Server). start - for when the application needs to be started. stop - for stopping it again. 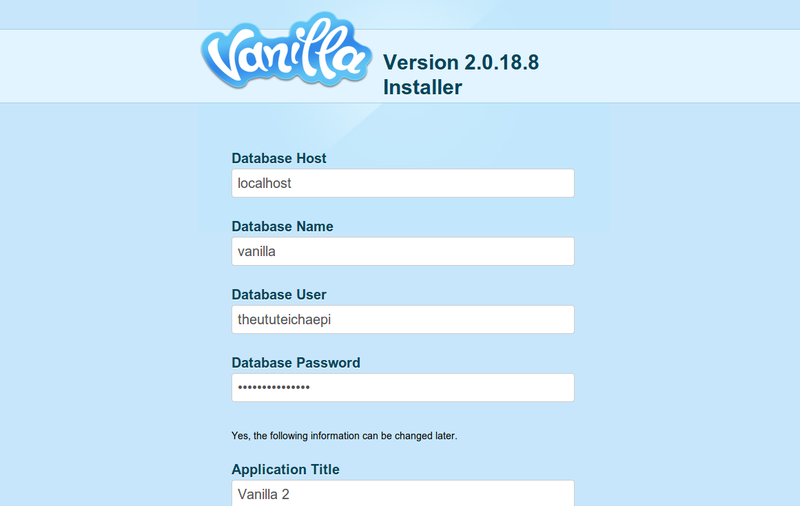 install - for actually fetching and installing the Vanilla code. database-relation-changed - this will run when we connect (or re-connect, or disconnect) our application to the MySQL database. This hook will need to manage this connection. website-relation-joined - this will run when/if a application connects to our charm. A bit of explanation for this one. As we are writing in bash, and we need the files to be executable, we start with a hash-bang line indicating this is a bash file. the set -e line means that if any subsequent command returns false (non- zero) the script will stop and raise an error - this is important so that Juju can work out if things are running properly. The final line starts the Apache web server, thus also starting our Vanilla service. Why do we call 'restart'? One of the important ideas behind hooks is that they should be 'idempotent'. That means that the operation should be capable of being run many times without changing the intended result (basically). In this case, we don't want an error if Apache is actually already running, we just want it to run and reload any config changes. Once you have saved the file, it is important to make sure that you set it to be executable too! # Grab Vanilla from upstream. status-set maintenance "Fetching and installing Vanilla"
# IDEMPOTENCY is very important in all charm hooks, even the install hook. status-set maintenance "Creating apache2 configuration"
status-set blocked "Waiting for active database connection"
Firstly, note the use of the -y option of the apt-get command. this assumes a 'yes' answer to any questions and removes any manual install options (e.g. packages that have configuration dialogs when they install). In our script, we are fetching the tarball of the Vanilla software. In these cases, it is obviously always better to point to a specific, permanent link to a version of the software. Also, you will notice that we have used the juju-log command and the status-set command. These are helper commands for Juju hooks (known as "Hook tools") and you will find them covered in more detail in the "how hooks are run" page. The status-set command is used to update the status and message displayed by Juju when users run the juju status command to see what is going on in the environment. There are a number of pre-defined statuses explained in more detail status reference page. It is a good idea to think about updating the status when significant events occur which have an effect on the operation of the application. The juju-log command basically spits messages out into the Juju log, which is very useful for testing and debugging. We will cover that in more detail later in this walk through. We know from our metadata that we have a connection called 'database', so we can have hooks that relate to that. Note that we don't have to create hooks for all possible events if they are not required - if Juju doesn't find a hook file for a particular action, it just assumes everything is okay and carries on. It is up to you to decide which events require a hook. juju-log "No database information sent yet. Silently exiting"
juju-log "Make the application port available, now that we know we have a site to expose"
You will notice that this script uses the command relation-get. This is another Juju Hook tool, which in this case fetches the named values from the corresponding hook on the charm we are connecting to. Usually there will be some indication of what these values are, but you can always inspect the corresponding hooks to find out. In this case we know that when connected, the 'mysql' charm will create a database and generate random values for things like a username and password. Interfaces in general are determined by the consensus of the charms which use them. There is a lot more information on decoding interfaces here. Some of the major interfaces are being documented to make it easier to use them, and fortunately, mysql is one of them - You can find a description of the mysql interface here. These values will all be set at one time, so the next little bit of script just checks one value to see if it exists - if not the corresponding charm hasn't set the values yet. When it has the values we can use these to modify the config file for Vanilla in the relevant place, and finally open the port to make the application accessible. Here we can see the other end of the information sharing - in this case relation-set exposes the given values to the connecting charm. In this case one of the commands is backticked, as unit-get is another helper command, in this case one which returns the requested value from the machine the charm is running on, specifically here it is the private IP address. So, any connecting charm will be able to ask for the values hostname and port. Remember, once you have finished writing your hooks make sure they are all executable by using the chmod +x command. For our simplistic charm, that is all the hooks we need for the moment, so now we can test it out! W - A warning; something which should be looked at but won't necessarily stop the charm from working. E - An error; these are blocker which must be fixed for the charm to be used. Which tells you that you forgot to add a copyright file, you have left some default text in the README, and one of your relations has no hooks. All useful stuff. This starts a process to tail the Juju log file and show us just exactly what is happening. It won't do much to begin with, but you should see messages appearing when we start to deploy our charm. See Viewing logs for more details. If you wait for all the Juju operations to finish and run a juju status command, you will be able to retrieve the public address for the Vanilla forum we just deployed. Copy it into your browser and you should see the setup page (pre-populated with the database config) waiting for any changes. Congratulations! With the charm working properly, you may consider everything a job well done. If your charm is really great and you want to share it, particularly on the charm store, then there are a couple of things you ought to add. Create a file called 'copyright' and place whatever license information you require in there. Add a beautiful icon (there is a guide to making one here) so others can recognise it in the charm store!